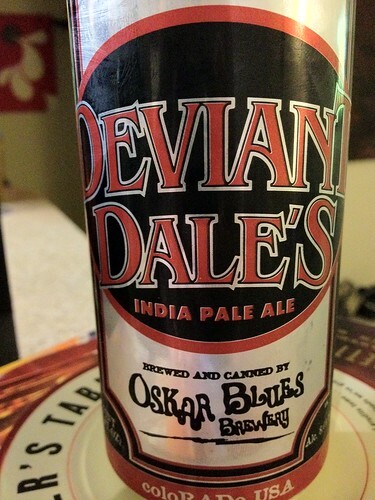 Oskar Blues Deviant Dales, originally uploaded by adambarhan. Appearance: Bright orange. Head is off-white, massive, and sticky as can be. Drops to a thin cap very quickly. Very clear. Smell: Grapefruit and biscuits layered over a damp hops. Faintly spicy with a touch of pine needles. Sweet without being sugary. Loads of biscuit. Some roasted notes along with some cooked grain. Green onions. Did I mention Hops! Mouthfeel: Medium body with a higher than expected carbonation. Dry and a touch crisp. Oily hops. Overall: Unique to say the least. The hop profile is definitely an acquired taste, that I have drifted away from. Definitely pour this in a glass to smell what your re in for. The can hides the aroma and making it shocking on the first sip. Hop Bomb in my book.